Life has been very hectic following the launch of the QCX CW transceiver kit (more later), this explains the lack of October newsletter, and here we are in November already! 10. 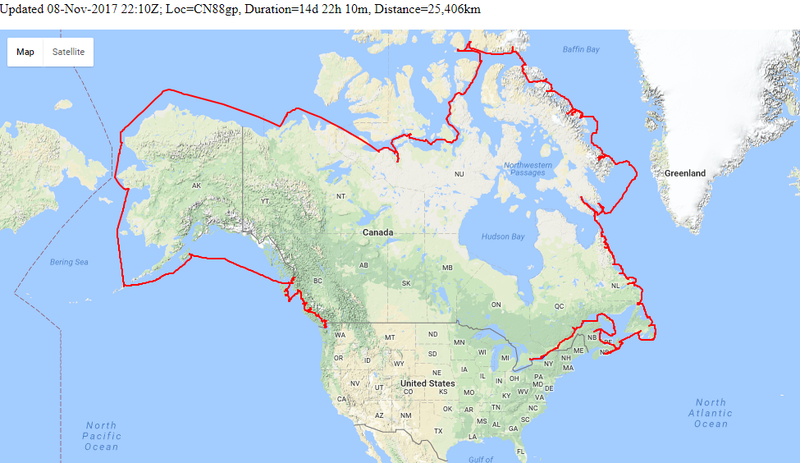 Canadian C3 expedition, tracked by U3S, is complete - and a huge success! 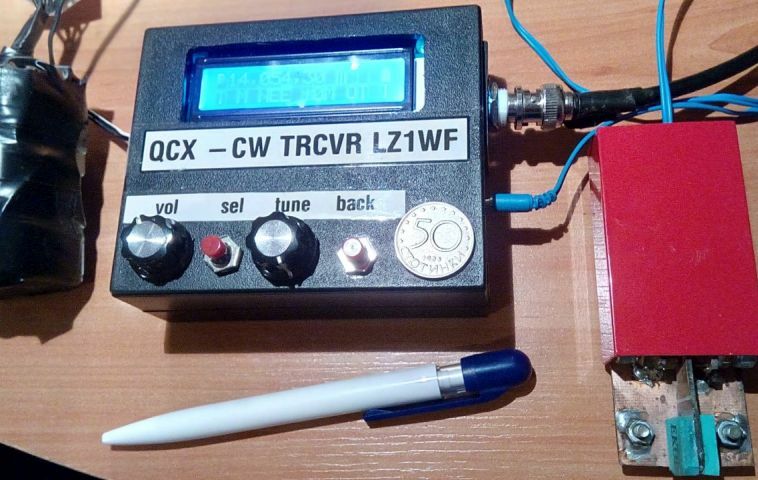 The 2000'th QCX CW transceiver kit was ordered on 08-Nov-2017, quite a milestone! An unbelievably popular kit, in just a couple of months since the launch! No doubt that the long features list, high performance and low price point is a winning combination. At the time of writing, a total of 1151 of those 2013 have been shipped. Which means that 862 are pending shipment. The QRP Labs shipment office are gradually dealing with the mountain of orders and getting caught up. 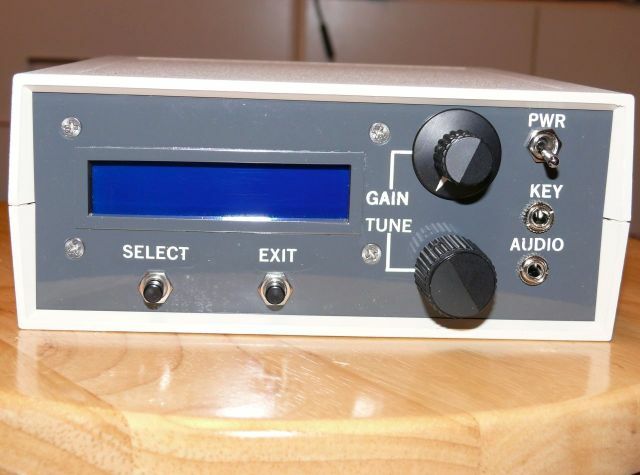 If you are waiting for a QCX shipment, you can find out which serial number the shipment office will ship next, on the QCX CW transceiver kit page http://qrp-labs.com/qcx.html. Other QRP Labs shipments are also delayed. If you are concerned or have any particular requirements or questions please contact us. To cope more efficiently with future higher demand, we are investigating ways to improve capacity at the QRP Labs shipment office, including larger warehouse facilities and hiring additional staff. But it takes time to get things like this organised, so please be patient. There have been several firmware updates, to fix minor bugs that were reported. The firmware version changes are listed on the firmware page. If you notice any peculiar issues with your QCX transceiver, it is worth checking the firmware page to see if it has been resolved in a subsequent firmware version. Your firmware version is displayed on the screen for a few seconds at power-up, and is also written on the label on your chip. The firmware can be downloaded from the QRP Labs discussion group in the files section. There is a nice tutorial written by Simon VK3ELH explaining how to use an Arduino to update your firmware, you can download the PDF file on the firmware page. You can also use an AVR programmer (available for as little as $3 on eBay) and software such as avrdude, avrdudess or extremeburner. There is plenty of advice about this available on the discussion group. .
A number of enhancement requests have also been received for particular new features etc., which will eventually find their way into the firmware, when a free moment is available! The first two are solutions to quite common problems; where the microcontroller does not start-up correctly at power-up, and needs switching off and soon on again, to boot up properly; the second one is a power amplifier instability which occurs in some cases, seemingly particularly with the higher frequency versions of the kit. They are easy modifications, just a single component. All of these modifications are well worth a look! Thanks to Peter DL6SDA and Shig JA1XRQ, the 138-page QCX assembly/operating manual is now available in German and Japanese translations, see the main QCX page. 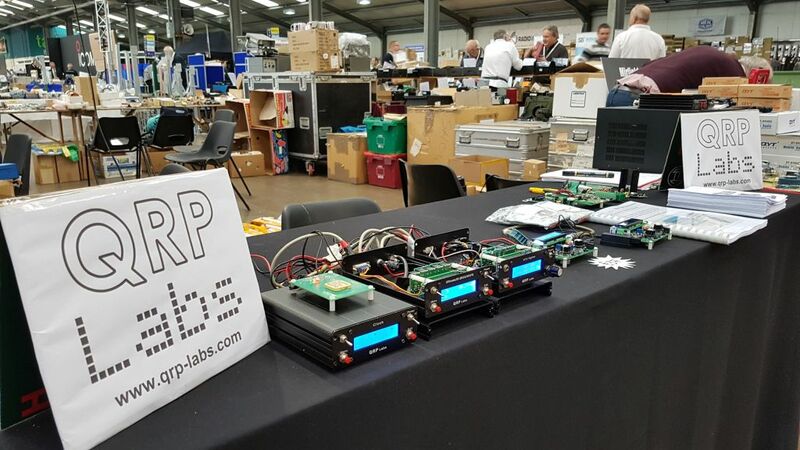 QRP Labs exhibited at the UK National Hamfest 2017 in Newark, Nottinghamshire, the UK's largest hamfest, on 29th and 30th September. The QRP Labs table attracted quite a reasonable crowd continuously on both days, which kept me very busy indeed. It was great to meet many QRP Labbers for the first time, too numerous to mention (even if my memory was capable of such a feat, which it is not). 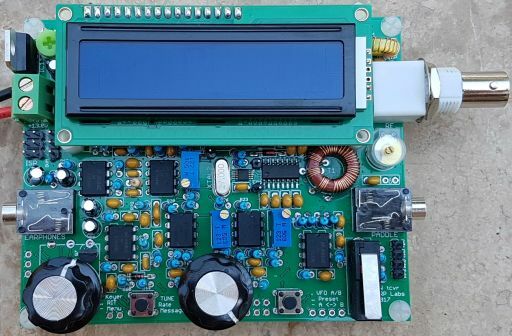 Some of them have built all of the QRSS/WSPR kits in the series from the first QRSS kit, to the Ultimate, Ultimate2, Ultimate3 and right up to the current Ultimate3S QRSS/WSPR/JT65/etc transmitter kit. Thanks for stopping by and introducing yourselves! 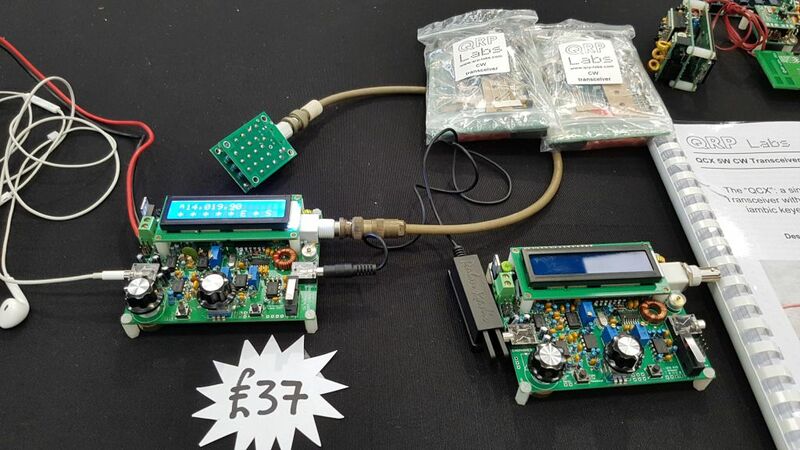 Most of the QRP Labs kits were on show, demonstrated on the table (see photos below), and some where available for purchase. The new QCX CW transceiver stole the show. I ended up with a sore throat, again, from all the talking! 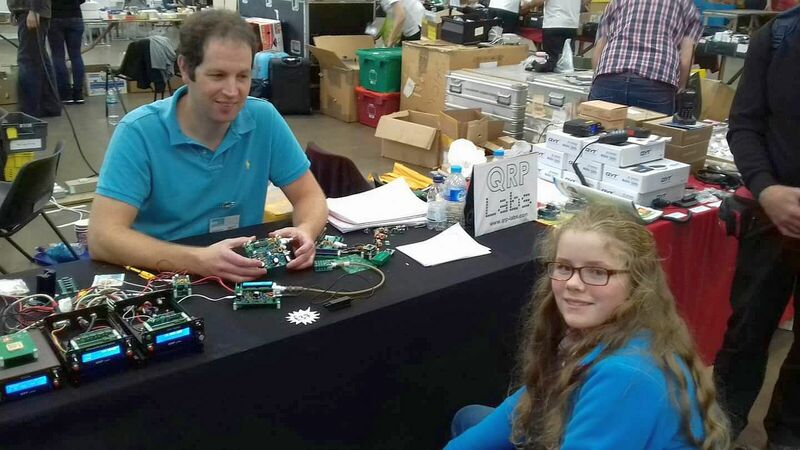 It was an honour to meet Lauren M6HNR (see picture below); Lauren (12) was the youngest constructor of the 17m version of the QCX CW transceiver kit. It was wonderful hearing the story of how she kept on at the construction until she had it all finished and working. Lauren is a young lady full of enthusiasm for her radio hobby; it is impossible not to be inspired by her enormous energy and enthusiasm! 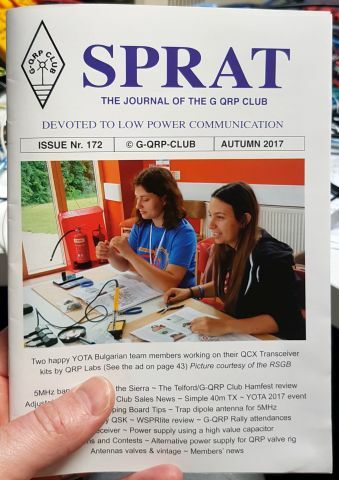 The front cover of the G-QRP Club's quarterly journal SPRAT, Autumn 2017 edition, features a picture of the Bulgarian YOTA team members happily constructing their QCX 5W CW transceiver kits (17m version). The G-QRP Club was a YOTA 2017 supporter. QRP Lab is proud to advertise in SPRAT (see inside back cover)! The Canadian C3 expedition is now officially complete. QRP Labs was proud to sponsor the Canadian C3 Coast-to-Coast-to-Coast expedition celebrating Canada's 150th birthday, by providing an Ultimate3S kit and accessories (QLG1 GPS receiver kit, relay switched filter board, 20/30/40m Low Pass Filter kits, and enclosure kit). The radio was installed by a team led by Barrie VE3BSB. The Ultimate3S has operated reliably for over 5 months, day in, day out. It has been copied on WSPR thousands of times every day, and tracked live on the QRP Labs website C3 page. Barrie VE3BSB informs me that the Canada C3 Expedition reached its final port at Victoria British Columbia on schedule, on 28 October 2017. During the voyage the Ultimate3S continued to operate faultlessly for 129,600 minutes, a total of 64,800 transmission cycles. Barrie has an extension for the special event call sign until year end. The Polar Prince will return to the east coast of Canada via the Panama Canal and the C3 Team has arranged with the vessel owner for the beacon to remain on, until the return to Halifax Nova Scotia. The tracking map will be maintained. 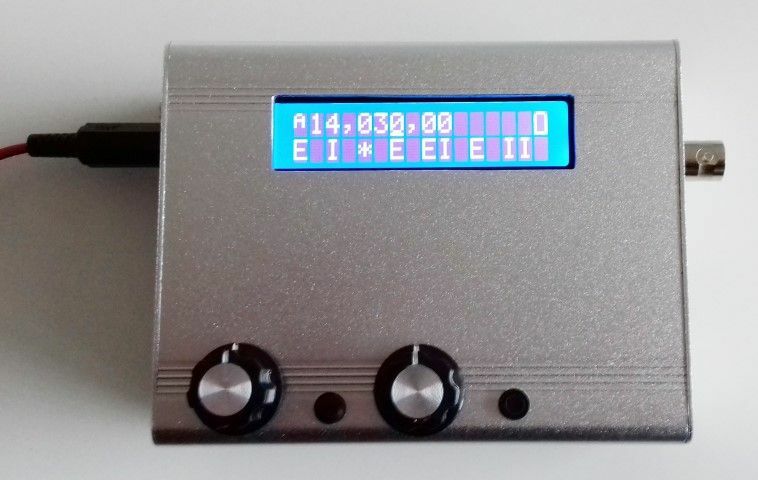 A reminder: the Ultmate3S transmits in Extended WSPR mode (with 6-character Maidenhead locator) 24 hours a day autonomously, on 40, 30 and 20m. 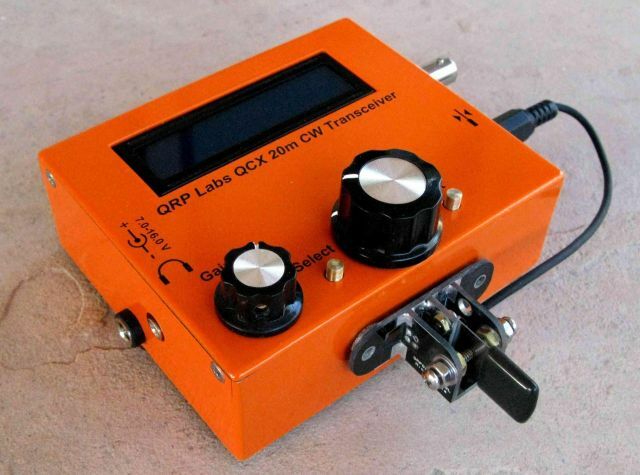 QRP Labs provides a tracking solution that populates a live map at http://qrp-labs.com/c3 - Jeff VE3EFF has provided a computer and stable internet connection to run the tracking. The map below shows the tracked path of the entire expedition. U3B-9: David VE3KCL's launch of the 9th QRP Labs U3B test flight on 20-Sep-2017 was already mentioned in the September newsletter, at which time the flight was still in progress. Following the launch it narrowly missed a fast jetstream to Europe and instead headed South for a leisurely tour of the United States. U3B-9 flew around in the Gulf of Mexico and Florida and nearby states for quite some time, before finally departing the US East Coast and heading to Europe. It arrived in Europe via a quick pass over Cornwall, UK's South-West corner, then South down through France. North African countries were next, followed by the Middle East. U3B-9 was last heard from in China, on the 23rd day of the flight, after travelling 26,000km. Full story: http://qrp-labs.com/flights/u3b9.html; flight path BELOW LEFT. 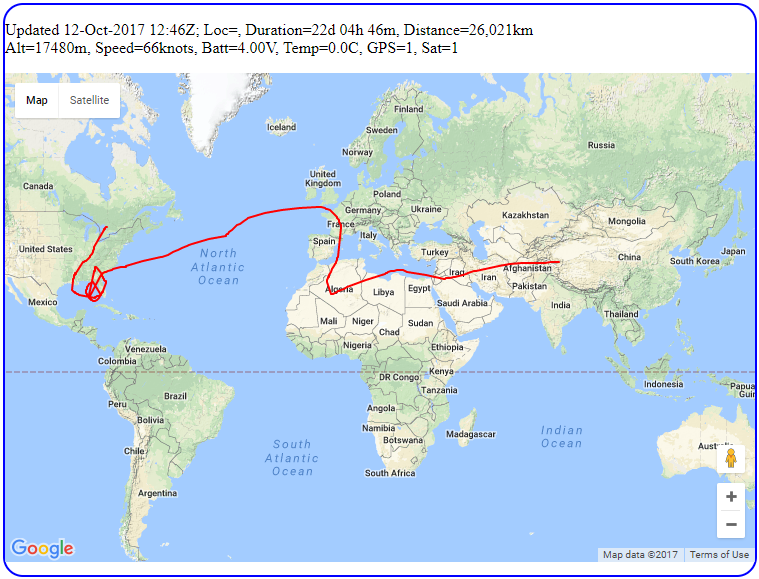 U3B-10: The QRP Labs U3B test flight U3B-10 was launched by David VE3KCL from Toronto, Canada on 01-Oct-2017 and made a very rapid transatlantic crossing in only 2 days. It crossed the Northern tip of the Scottish mainland, Denmark, and the southernmost tip of Sweden, then on into Poland, Belarus, Ukraine and Russia. The flight was quite notable for the way it ended! The transmitter had shut down for the night. But for whatever reason the balloon lost altitude, during darkness, and as it descended the temperature warmed up. The warmer temperatures thawed out the battery enough that it could discover it still had some usable charge, and operate the transmitter for a while. The altitude continued to fall, and the battery charge soon depleted, so the transmitter shut down again, over Ukraine. That SHOULD have been the end of the matter, since U3B-10 should have landed somewhere. But surprisingly, the following morning U3B-10 showed up in Russia, somewhat south-east of Moscow. It must have evaporated enough moisture as the temperatures increased, to give it enough lift to survive a few more hours! It was only temporary, however, and U3B-10 landed on the morning of its 8 day. See http://qrp-labs.com/flights/u3b10.html; flight path BELOW RIGHT. U3B-11: The 11th QRP Labs U3B test flight was launched by David VE3KCL on 08-Nov-2017 but was doomed by an early balloon failure a little over 10,000m altitude. It only flew over Lake Ontario before landing East of Rochester NY. Interestingly, it continued to transmit from the ground for some time, indicating that the solar panels must have remained intact after the landing. STELLA-6: Dan DL6OW launched Stella-6 on Saturday 07-Oct-2017. The flight is notable for being Dan's most successful flight to date; it flew South over Austria and down over the Adriatic sea, then turned East along the southern coast of Greece. Stella-6 was last received on its 2nd day, at an altitude of just under 9000m, and a little North of Crete in KM25CU. See http://qrp-labs.com/flights/stella6.html. STELLA-7: Dan DL6OW's Stella-7 flight on 31-Oct-2017 ended a few moments later in a TREE... a reminder of the many perils that await balloonists. It's not easy, and everything has to be just right. STELLA-8: was launched by Dan a few days later on Sunday 5th November at 1400Z in rather bad weather. There was lightening in the area soon after launch. The last transmission from the balloon was only half an hour later, by which time it had reached an altitude of 3,240m. That bad weather should be the end of Stella-8 BUT, the transmitter was copied 2 days later on 07-Nov-2017 at 0930Z by SM0EPX. The balloon was in grid square KP17 which locates it right up in the North of Sweden/Finland (that grid square straddles the Swedish/Finnish border). There was no second transmission recorded (the telemetry transmission) so the altitude is not known, and the map was not updated. But the spot can be seen in the WSPRnet database http://wsprnet.org/olddb?mode=html&band=30&limit=100&findcall=DL6OW&findreporter=&sort=dat . The tracking map for Stella-8 is http://qrp-labs.com/flights/stella8.html. So far North, the sun never rises more than a few degrees above the horizon at this time of year. So it is remarkable that the solar panels collected enough energy to power Stella-8 for a transmission. Many mysteries remain about Stella-8. Why so few spots after the launch? Was there transmitter or antenna damage in the storm? Is Stella-8 still flying, but so far North that it cannot collect enough solar energy to transmit? Or with such low radiated power that nobody can copy it? 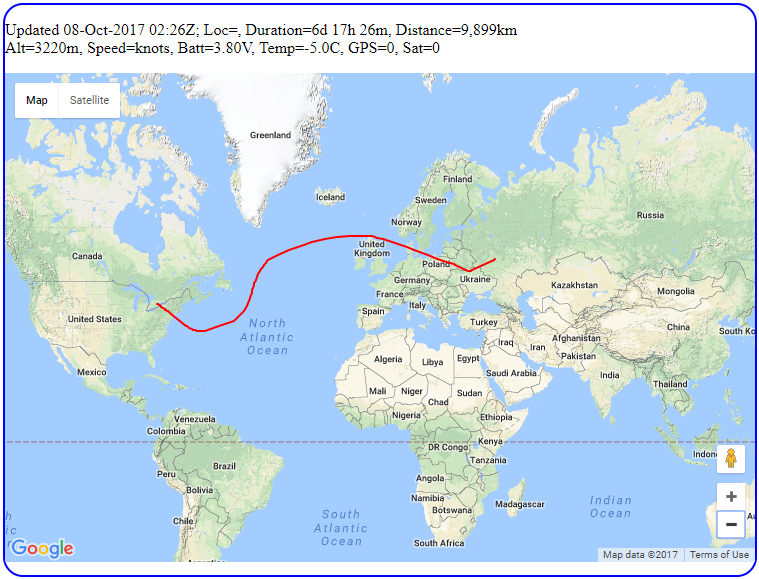 U3S-19: Jim N2NXZ launched his U3S-19 flight on 08-Nov-2017 also. Coincidentally Jim lives in Rochester, not far from where Dave's U3B-11 flight landed on the same day. Jim's flight was not expected to reach a high altitude, it ascended to just over 5000m altitude and headed East. See http://qrp-labs.com/flights/u3s19.html for details.